Our ever popular photo contest is back! Three years ago we launched our photo contest and couldn’t have been more impressed with the results. Thousands of incredible images of people climbing, hiking and partying during Ice Fest weekend. So, how could we not do it again? So without further hesitation, here are the rules for the #MichiganIceFest2019 Photo Contest! During the weekend of Ice Fest (February 13th -17th) snap some photos. Photos of climbing, socials, approaches, whatever as long as you feel it represents your Ice Fest experience. Post your photos to social media (Facebook, Twitter or Instagram) with the hashtag #michiganicefest2019. You can enter as many times as you want. Please make sure your privacy settings allow us to view your photos. We can’t judge what we can’t see. Feel free to tag us in the photos as well. When the event is over, all of the photos tagged with #michiganicefest2019 will be judged by a panel of Ice Fest staff. Photos will be judged based on some seriously strict guidelines like exposure, composition and creativity, and coolness. The panel’s twenty favorite photos will be shared on the Michigan Ice Fest Facebook page and the photo with the most likes at the end of one week will be the winner. You must attend the Ice Fest to be eligible and photos need to be taken during the event. Pretty easy. It doesn’t cost you a dime and we know you’re posting all of your sweet Ice Fest shots anyway, so you might as well try and win something. The prize will include a registration for the 2020 Michigan Ice Fest and a class of your choice at next year’s event. On top of this already stellar prize, we are throwing in gear and clothing from some of our event sponsors. 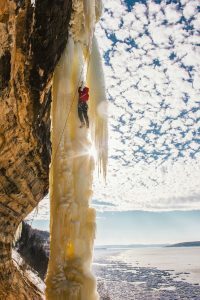 So when you get to Munising make sure you pull out your phone or camera and take your best shot at winning the Michigan Ice Fest 2019 photo contest!